With the Brotherhood persecuting witches like never before, a divided Sisterhood desperately needs Cate to come into her Prophesied powers. And after Cate's friend Sachi is arrested for using magic, a war-thirsty Sister offers to help her find answers—if Cate is willing to endanger everyone she loves. Cate doesn't want to be a weapon, and she doesn't want to involve her friends and Finn in the Sisterhood's schemes. But when Maura and Tess join the Sisterhood, Maura makes it clear that she'll do whatever it takes to lead the witches to victory. Even if it means sacrifices. Even if it means overthrowing Cate. Even if it means all-out war. In the highly anticipated sequel to Born Wicked, the Cahill Witch Chronicles continue Cate, Maura and Tess's quest to find love, protect family, and explore their magic against all odds in an alternate history of New England. After reading Born Wicked the first book in the Cahill Witch Chronicles I was anxious to dive back into this world. 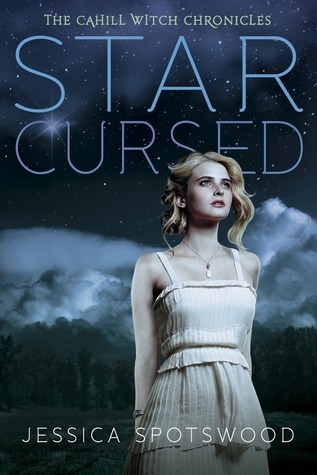 I never imagined that Spotswood could make the world anymore sinister but in Star Cursed she did just that! I slipped right back into this world and once again found myself captivated by the prophecy, characters and dark oppressive world. I literally consumed this and didn't want the tale to end. Three word review: captivating, suspenseful, emotional. The tale picks up a few weeks after Cate declared herself to the Sisterhood. She is now in New London and living with the sisters. She doesn't know who to trust, longs for Finn and misses her sisters. She quickly realizes there is a divide within the Sisterhood on how to deal with the controlling and ever violent Brotherhood. The climate is volatile as more girls are accused and tortured. Tragic events and dark times have Maura and Tess joining the Sisterhood. Finn is in town with the Brotherhood and he and Cate risk seeing each other. Everything is unraveling and Cate must decide once and for all how she will stand. The tale that unfolds is a mix of dark and light and kept me completely enthralled in its captivating web. I liked Cate in Born Wicked despite a few issues with her handling of her suitors, but I feel in love with her in Star Cursed. Cate has begun to accept who she is and the responsibilities that come as a consequence She has always been selfless and despite wanting to have it all, she sees the whole picture and thinks with her head not her heart. I really struggled with Maura in book one and loathed her in book two. Forget the middle-child syndrome the more page time she got the more I wanted to slap her. From her jealousy to her obsession with being the chosen one she is going to see them all killed! This added a level of fear to the tale because honestly despite her protest I believe she is capable of true evil. Tess is still her adorable self and we see changes in her throughout the novel. She and Cate confide in each other as the rift between Maura and Cate grows wider. Finn is back and I was so glad to see he will play a major role. I enjoyed their sweet interactions, but found myself terrified they would be discovered. We learn more about the Sisterhood and a few key sisters. Others characters and the Brotherhood add to the suspense, and flesh out the world and characters. Sometimes second books suffer and aren't as captivating as their predecessor but Spotswood raised the bar. She gave us a deeper understanding of the world and the characters. She makes you feel the oppressive world around you as she paints a clear picture from struggling hungry families, to the fear that quells in their bellies as the Brotherhood approaches. The Brotherhood is an oppressive, controlling government ruled under the guise of religion and obsessed with the prophecy. They seek to destroy the witches and keep woman from having any power. The people are becoming restless and the witches are demanding war as more restrictive laws pass. The tension and suspense was delicious as we all began to fear the second Terror. Spotswood slowly increased the tension as the tale progressed keeping me on the edge of my seat. I loved her descriptions of the town as well as Harwood and the conditions there. She gives us a panoramic view and I felt like I was a sister walking along side Cate. We see death, betrayal, and love. All of these played on my emotions and kept me vested. The ending was both exciting and mind-blowing. We are left with a heart-wrenching honest to goodness, stop your heart, mother of all cliffhangers. The air turned blue at my house as I vented my frustration. Book one ended in a cliffhanger but it looks like a speed bump compared to the cliff we fall of here. If cliffhangers do you in, hold off reading this till closer to the next release date.